It DOES get me writing. Unfortunately for the characters in the many notebooks on my desk (and for my bank account) it also takes away time from REAL work. The trick is to [QUICKLY] find an interesting quote from an interesting person who is having a birthday on a given day. Hopefully that person will have some interesting art associated with him/her. Then I go to two or three websites and read about the person, write and edit the post, add the links, tags and categories, and put in the artwork. Grab the”quick link” code, PUBLISH, and go on Facebook and Twitter and let folks know that the new blog post is… errr… posted. WHY am I telling you all this? Well I’ve been meaning to explain my process for awhile, and… Luciano De Crescenzo dropped this little gift of a quote into my lap. Luciano is the prefect subject for me. Great quote (lots of great quotes actually, but this one! Bellissimo!) There’s not a ton of information for me to slog through in the research stage (like there was for good ole Orville — yesterday’s subject.) And I know next to nothing about him, so I’m sure to learn a lot. 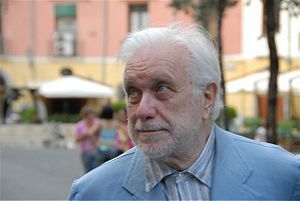 Luciano De Crescenzo was born on this day in Naples, Italy in 1928. He is 84 years old. He has a degree in engineering and worked for IBM before shifting gears and writing about his beloved Naples. His first book was published in 1977 and was titled Cosi Parlo Bellavista (Thus Spake Bellavista.) He has written 20 more books, been translated into 19 languages. His books have sold over 20 million copies. His natural charm and Italian good looks led him to film in 1980. De Crescenzo has added screenwriter, actor and director to his CV as he has worked with Italian movie legends from Teo Teocoli and Isabella Rossellini to Roberto Benigni. 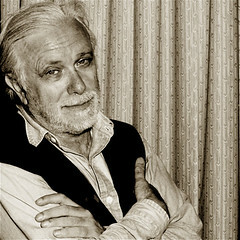 This entry was posted on Monday, August 20th, 2012 at 1:26 pm	and tagged with Luciano De Crescenzo and posted in Film, Luciano De Crescenzo, Non Fiction, postaday, Thought of the Day, Today's Birthday, Writing. You can follow any responses to this entry through the RSS 2.0 feed. Sorry I don’t know how to speak/read Italian (?). But your blog looks interesting. Best of luck.